The Nintendo 64 was actually the first game console I ever bought at launch. No standing in line, I just walked into Electronics Boutique and picked one up mid-morning. I also picked up the newest Mario game. Mario may have started off as a mere plumber who occasionally saved the Mushroom Kingdom, but it didn't take him long to show what a true Renaissance man he really was. By the time the N64 finally gave way to a new generation of consoles, Mario had dabbled in go-kart racing, a variety of sports, unlicensed medicine, board games, prize fighting, art and music, and adventuring—to name a few. Surely he's the hardest working man in video games. To all young gamers out there, or older folk who only recently got into video games, I pity you. I pity you because your introduction involved modern games with graphics good enough to mimic the real world (kinda sorta, we'll talk uncanny valley a bit later). I pity you because you did not live through the early evolution of video games. You did not experience the transition to 3D. You did not live the epiphany of Mario 64. You may only see these early games as quaint. Perhaps you understand their historical value in an academic sense, but you will never live that "wow" moment. I imagine it's how people felt upon seeing the first motion pictures. It was at a Toys R' Us demo kiosk that I got my first hands-on with a true 3D game, polygons and all. Let's see a show of hands—who spent all of their Mario demo time running around outside the castle? Climbing trees, long jumping, back-flipping, watching actual fish swimming in the pond, diving into the moat, listening to the waterfall; each simple action was a wonder in itself. Mario 64 wasn't a game, it was a series of profound discoveries on that first magical play through. Of course now I can pick out the flaws, like the unresponsive camera, or how Peach's castle apparently existed in a very low friction pocket dimension (either that or Mario rolled around in butter prior to his visit). 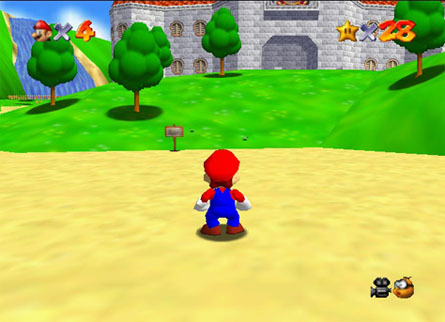 Nintendo seems to be remaking some of their N64 classics lately, and I really could go for an updated Mario 64. On my most recent replay, I grabbed all the stars from the early levels to avoid playing too much of the later ones where camera and controls become enough of an issue to irritate on the harder levels. A remake that fixed these problems would certainly get my interest. 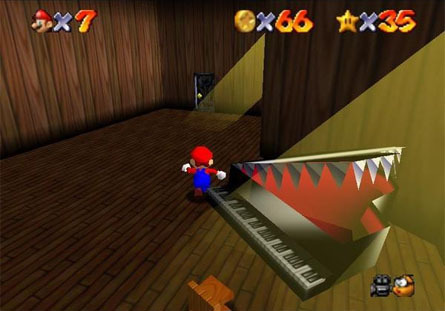 That damned piano. Only thing in a game to ever make me scream. Screw that thing. A remake would be nice, but even more so, I'd like to see Nintendo revisit one particular idea from this classic. 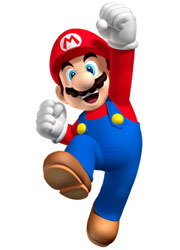 Whatever game play theme dominates the next Mario, be it gravity or squirt guns or costumes, give us a hub world full of surprises to discover. Peach's castle wasn't just a structure housing paintings that acted as obvious portals to game levels, it was also loaded with the unexpected. The blank wall in the basement that lead to a desert, the bird cage that shrunk Mario down, swallowed him up, and dropped him into a haunted mansion, the hidden slides... all of these things were as much fun to find as the actual levels were to play. I'd love it if the next Mario game took this idea of hiding levels and other surprises in a hub world and expanded on it in a big way. I'm really not a sports fan, not in life and not in video games. If Mario Tennis didn't feature a cast of characters from the Mushroom Kingdom, I never would have given it a first look, much less a second. I bought it for the novelty and quite enjoyed it. 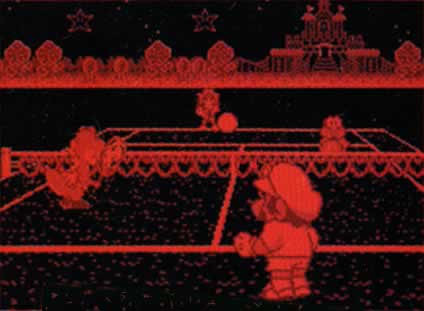 Interestingly, Mario Tennis was not the first time Mario actually played tennis. That distinction goes to Mario's Tennis (note the all important apostrophe) for the Virtual Boy, a game that predated Mario Tennis by 5 years. Virtual Boy was one of the few Nintendo systems I never owned. 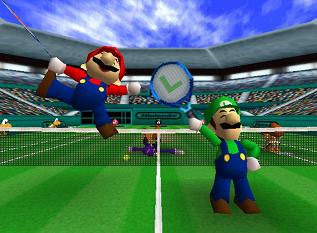 Mario Tennis was also the game where Mario's ever overshadowed brother Luigi got his own villainous counterpart. The awkwardly named Waluigi made his first appearance here. Mario Tennis is a remarkably in-depth game, allowing the player to hit all manner of shots with the right combination of button presses- a depth mostly lost on me. I won the single player cups and that was good enough. These days, if I want to enjoy a tennis game I'll just fire up ping pong on Wii Sports Resort. I'm a very casual player here, I admit it. With that in mind, Mario Tennis goes on the cull pile. It's a game that deserves a more appreciative owner. As much a delight to play now as it was when freshly minted, Paper Mario is a fun, easy-going RPG with a very pretty visual style that reminds me of Yoshi's Island. But, what inspired such an odd aesthetic choice? Why paper? I've always harbored my own hypothesis. The style was a child of necessity to hide the N64's short comings. The N64, and the first generation of 3D consoles in general, were pretty limited in how many polygons they could render on screen, and how large texture maps could be. These limitations didn't suit the RPG genre very well, since towns full of people were always a mainstay. Final Fantasy scooted around the problem by presenting characters as 3D polygonal constructions moving against a prerendered background. Other games took the opposite approach by populating polygonal worlds with sprite characters. I can't help but wonder if this latter approach was how Nintendo started their Mario RPG project. Then, somebody got the idea that if the characters were going to be flat anyway, why not make that a theme? 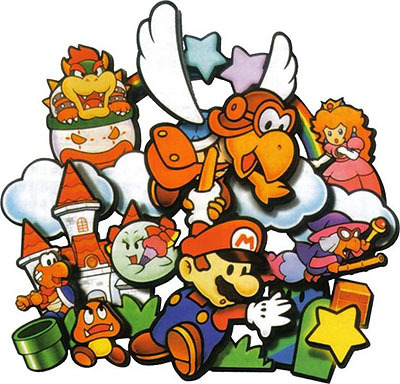 Well, however it came about, the paper-thin characters that populate the world of Paper Mario are charming and the art style is a real stand out. I'm already looking forward to playing the GameCube sequel, which took the paper theme even further.